I’m a self-admitted night owl and most of my television viewing is done after 8:00 pm. This wouldn’t be a problem if I were living alone but unfortunately for me, that’s not the case. My roommate is not a night owl and usually goes to bed around 10 o’clock. This is where me watching TV well into the wee hours of the morning becomes a problem. I’m a very contentious person and turn the volume way down once my roommate turns in for the night but this makes my viewing experience less than optimal. 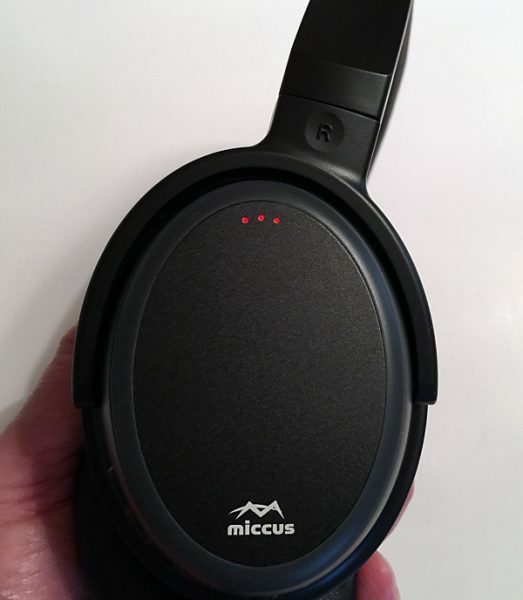 I was then given an opportunity to review the Miccus Home TX pro audio transmitter along with a pair of their SR-71 Stealth headphones. Needless to say, I jumped at the chance. Do these two devices solve my late night viewing problems? Let’s take a look. The Home TX Pro transmitter is small in size and very light weight, perfect for sitting next to your TV. Setup is pretty simple. First, you must attach the supplied small antenna to the antenna terminal. Before powering the unit on you must decide the audio source. They’re two choices: digital or analog. Select the source by sliding the slider switch (located on the back right of the TX Pro) left for digital and right for analog. 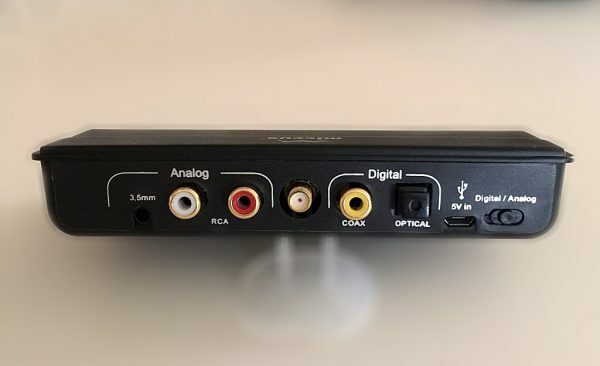 Then connect the appropriately included cable (optical, RCA to 3.5mm or RCA to RCA) to the appropriate audio input on the back of the unit. 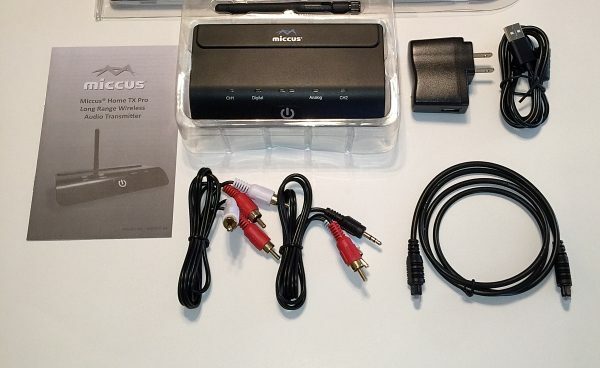 I connected the unit to my TV using the provided Toshlink digital audio cable. 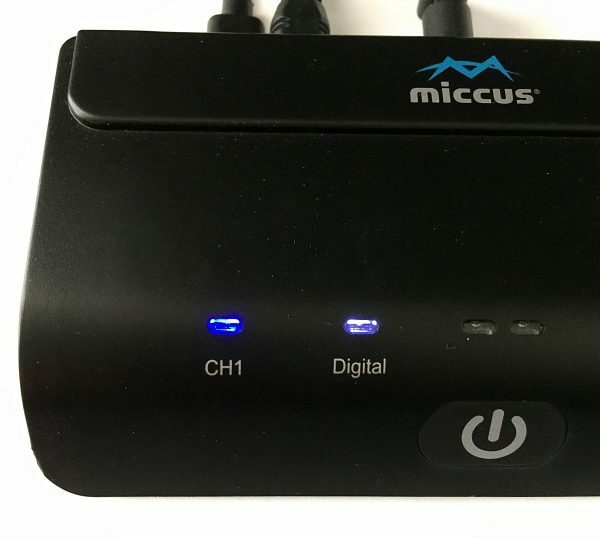 The unit can be powered two ways either by connecting the provided Micro USB charging cable to the provided USB power supply or by plugging it into any USB port. For me the USB port option was convenient, I just plugged the unit into one of my TV’s USB ports. Powering the unit on is done by holding down the Multi – function/power button for 3.5 seconds. Turning it off is done the same way. To pair the Home TX Pro with your Bluetooth device place the selected device into pairing mode. Then press and hold the units Multi – function/power button for 8.5 seconds until the indicator light changes from a slow flashing red to a fast flashing red and blue. When pairing is successful the far LEFT (channel 1) indicator light will turn a solid blue. 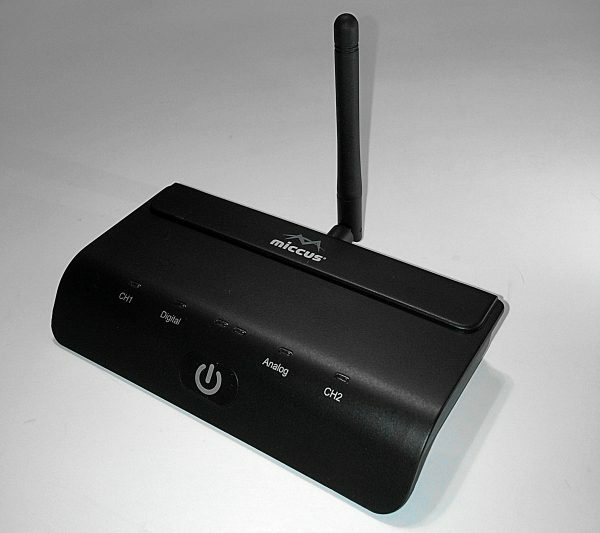 The unit can be used with any Bluetooth headphones that support A2DP profile. 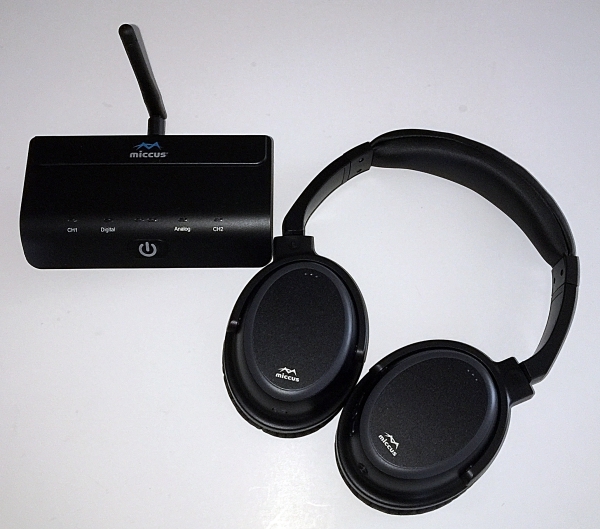 The Home TX Pro also offers Dual – Link pairing which allows you to connect two separate Bluetooth devices at the same time. Once you’ve paired your first set of headphones to the Home TX Pro power it and the headphones down. Repeat the pairing process for the second pair of headphones, once they’re connected to the unit the far LEFT (Channel 1) blue indicator light will turn solid blue. 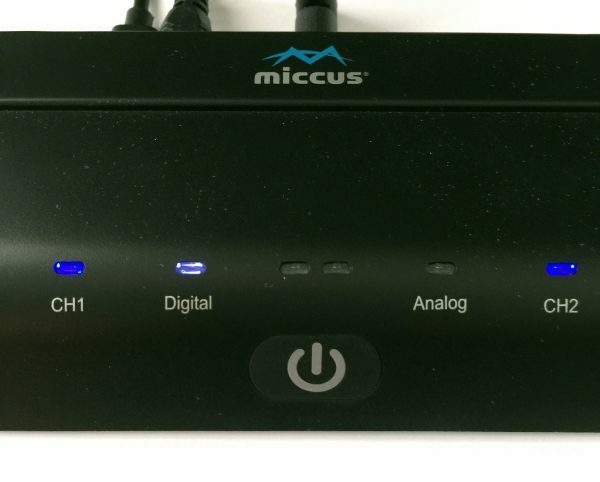 Turn on the first pair of headphones and they will automatically connect to the Home TX Pro, and the far RIGHT(channel 2) indicator will turn solid blue. 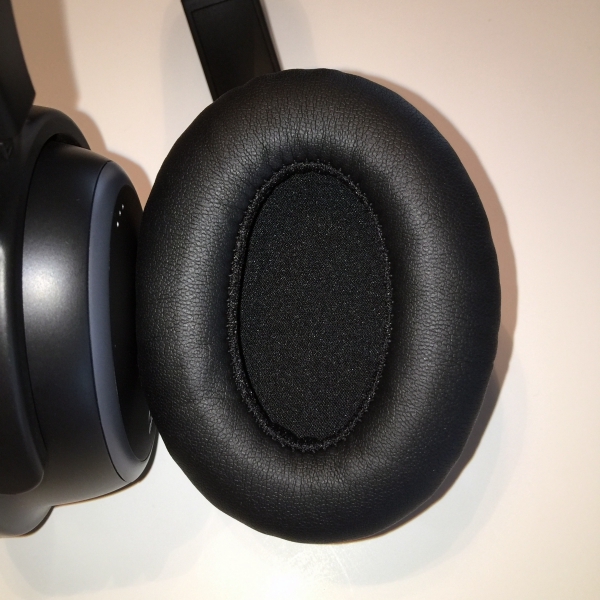 Both headphones are now connected to the Home TX Pro. Personally, I don’t have much use for this feature but tried it out for the purpose of this review and it worked flawlessly. I was able to quickly pair 2 separate pairs of headphones and both sounded crystal clear with no audio delay or lip sync issues. 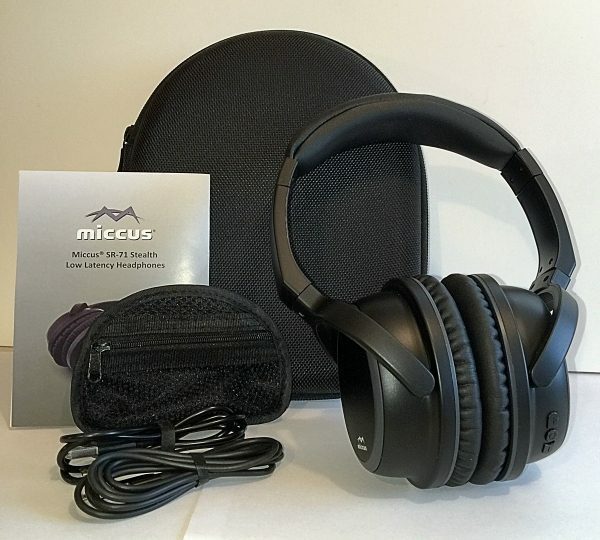 I also received a pair of Miccus SR-71 Stealth low latency headphones to review. They use the aptX Low Latency codec which means they clock in at 32ms of latency so there is no noticeable lip sync or audio delay when watching TV, movies or playing video games. I was very excited to try these headphones in conjunction with the Home TX Pro transmitter for my late night TV viewing. The SR-71 Stealth headphones feature a comfortable, lightweight design and ergonomic construction. 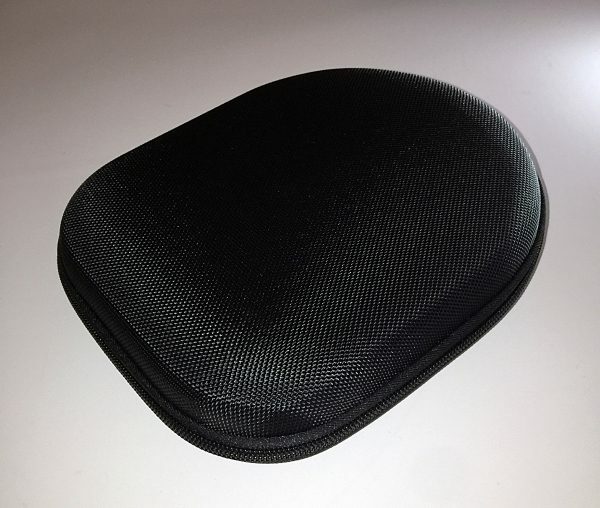 They’re very well padded with a soft leather covering, both on the ear cups and on the easily adjustable headband. The function buttons are located on the right earpiece. There are 3 buttons the Multi – Function button or (MFB) and a volume up (+) and volume down (-) buttons. The MFB is used to perform several functions, power on and off, make/answer/end/reject calls/play & pause music and voice dialing. Besides raising and lowering volume the (+) button is used for the previous track when listening to music and the (-) button is used for next track. There is also a LED indicator light located on the side of the right earpiece. 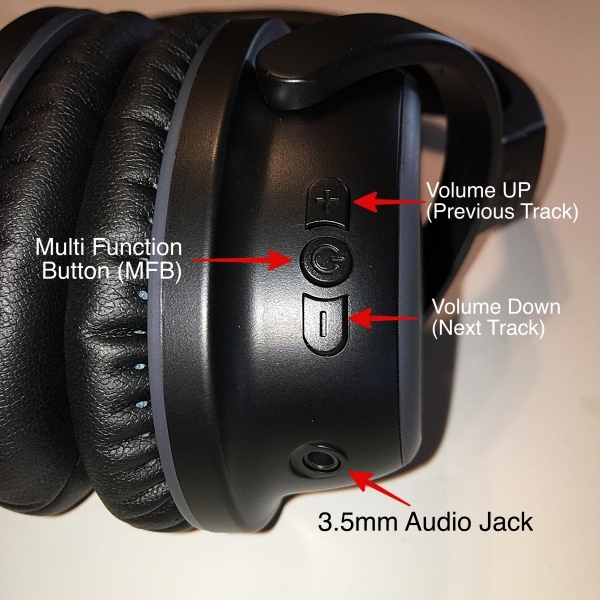 And there is a 3.5mm audio jack so you can connect the provided detachable 3.5mm Aux cable and use the headphones with a none Bluetooth device. The headphones can be used with the 3.5mm Aux cable even when the battery is not charged. Pairing the SR-71’s is done by holding the MFB down until the LED indicator light flashes red and blue. Select the headphones from your device’s Bluetooth settings menu, when the headphones are connected the LED indicator light will turn solid blue. The SR-71’s connect using Bluetooth 4.1. The manual states that the operating range is up to 33ft. I was able to walk around my entire house and even did some laundry without once losing connection to the Home TX Pro. I was even able to listen to my TV while out on my front porch while letting my dog out. The SR-71’s Dual – Link Pairing feature allows for them to connect to two devices at the same time. I paired them with my phone and the Home TX Pro transmitter. This allowed me to answer an incoming phone call while listening to my TV. A single press of the MFB answered the call and when I finished another press of the MFB returned me to the TV audio. 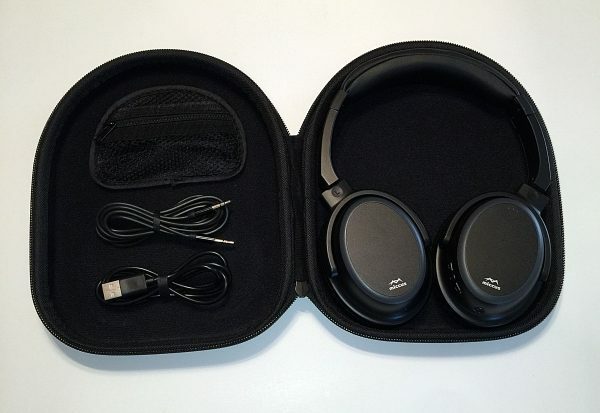 I really like that Miccus provides a nice hard shell case for these headphones. It just makes it so much easier to store them inside my TV stand. Each earpiece on the headphones pivots which allows for them to lay flat inside the case. 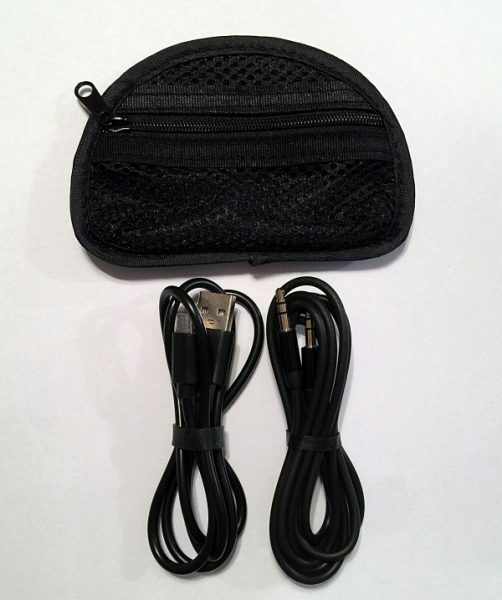 There is also a small mesh zipper pocket that holds the Micro USB charging cable and 3.5mm Aux cable that attaches to the inside of the case using velcro. So you can detach it to easily access the cables. A small thing but I like it. 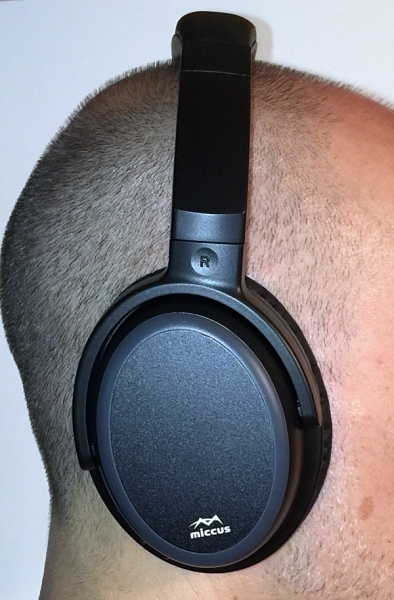 One of the most impressive features of these headphones is the battery. They fully charge in 3 hours and have a listening time of a whopping 15 hours. This is awesome especially if you’re going to use them on a daily basis. 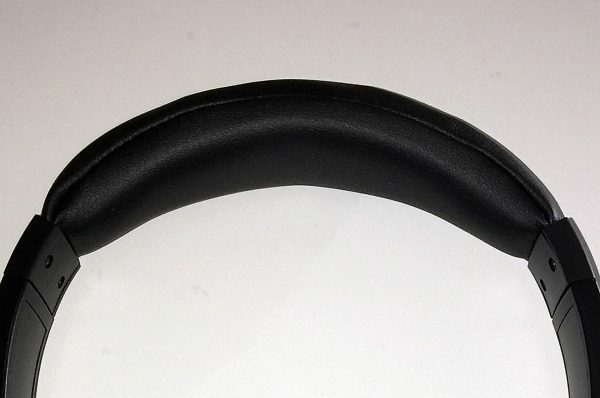 The SR-71’s are charged using a Micro USB cable that plugs into the port located on the bottom left earpiece. When charging the LED indicator light glows red and turns off when fully charged. 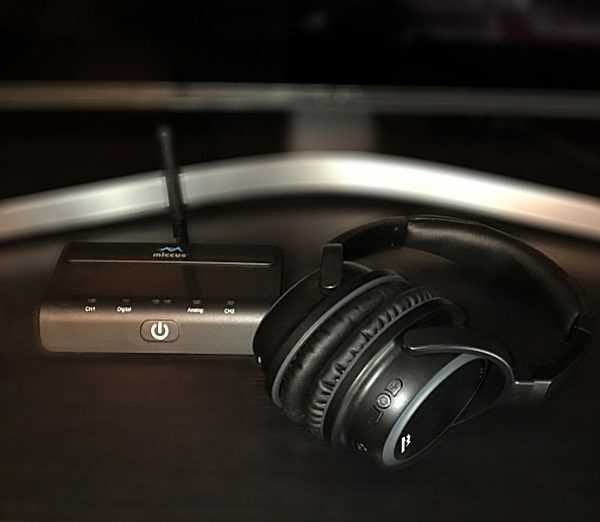 For my review, I paired the headphones to the Home TX Pro Transmitter so that I could use them to listen to my TV. However, I did pair them with my iPhone to see how they sounded while listening to some tunes. I wasn’t disappointed. 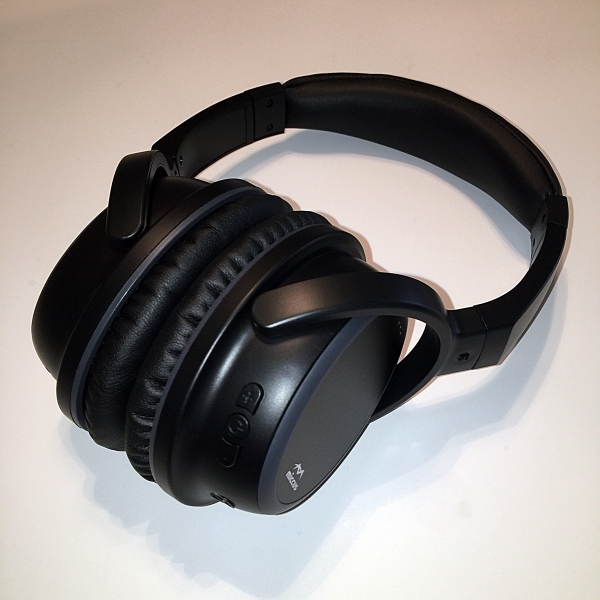 The headphones handled music very well and it was a pleasant listening experience. I also tried out the calling feature and again the SR-71’s performed solidly. My call was clean and clear on both ends and making and receiving the calls using the MFB button and Hands-Free Calling was easy and worked flawlessly. To activate Hands-Free Calling you simply press and hold the MFB button for 3 seconds, once you hear a “beep” release the button and use voice command to dial a number. Time to find out how SR-71’s handled watching movies and sporting events through my TV using the Home TX Pro transmitter. Pairing the headphones with the Home TX Pro Transmitter was simple following the instructions I detailed earlier. 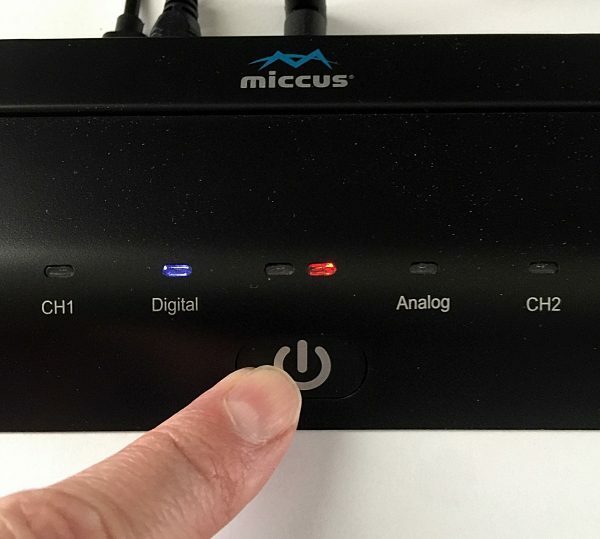 Once paired in order to get the TV’s audio through the headphones I had to go into my TV’s audio settings and select PCM as the Digital Audio Out Source. The sound was great, there was absolutely no delay or lip sync problems with the audio what so ever. Even pausing, rewinding and fast-forwarding using my DVR caused no lip sync issues. The audio synced up perfectly each time. I watched a baseball game and I was very impressed by the sound quality. The announcers’ voices were very clear and were separate from the crowd noise. Almost a virtual surround sound. A definite ambiance I didn’t get while listening through my 5.1 sound bar at a very low volume. I really enjoyed watching the game using the SR-71’s, and the best thing was I didn’t have to worry about how loud the volume was. So watching sporting events on these headphones was great, now the only question that remained is how well these bad boys performed while watching a movie. I chose to watch Mad Max Fury Road because I wanted a movie that had a lot of action and explosions. All the dialogue was very clear, the explosions and movies soundtrack sounded great, with no lip sync issues, or audio delays. I didn’t get the room rumbling bass (something my roommate and dog really love BTW) with the headphones that I get from my 5.1 sound bar but I was very happy with the overall listening experience. I did get some intermittent static or chirping during some of the action scenes, not sure what the cause was, however, it’s something I can live with. Mad Max is just over 2 hours long and I didn’t have to constantly fuss with the headphones as they remained comfortable the whole time. And I really like that they fit over my ears, this helps block outside noise and the sound feels more immersive. I even had my 72-year-old mother, who pretty much hates technology try these headphones. She often has trouble understanding dialogue while watching TV. I thought that the headphones would help with that and she agreed to be my guinea pig for the experiment. She wore them for about an hour and I asked her how she liked them. She liked that she could clearly understand the dialogue and really liked the overall sound. Her only complaint was that she felt she could only stand to wear them for about an hour, after that they began to hurt her ears, which she attributed more to her age then the headphones being uncomfortable. Together the Miccus Home TX Pro long range wireless audio transmitter and the SR-71 Stealth low latency headphones are a powerful duo. They definitely solved my late night TV listening problems. If you already own a nice pair of Bluetooth headphones you can purchase the Home TX Pro on its own for $79.99. The SR-71 Stealth Headphones sell for $59.99. So if you’re looking for a way to listen to movies, sporting events or TV shows without bothering others in your house, live in an apartment or have hearing problems, the Home TX Pro transmitter and SR-71 Stealth headphones from Miccus are definitely a worthwhile investment. Source: The samples for this review provided by Miccus. Please visit their website for more info and Amazon to purchase. I also have parents with hearing issues however rather than a headphone I set up a bluetooth speaker closer to their sitting area. That did the trick for them. I actually used a different BT transmitter (one I saw here as a matter of fact – HomeSpot Low Latency BT Transmitter ($25) – https://www.amazon.com/gp/product/B00QV77XU6).